As a high-quality custom leather label manufacturer, we have competitive prices, allowing you to add value to luxury brand products using genuine leather, or faux, rubber or PU leather. Genuine leather labels have a soft, textured feel to them, unparalleled by any imitation. Genuine leather labels are the most luxurious, classy option when it comes to label material choice, but there are other options available for those on a slightly tighter budget. Firstly, we have faux leather, which is very similar in appearance to genuine leather. From a distance it’s almost impossible to tell the two apart, but, under closer inspection, there is a slightly rubbery aesthetic on the front. 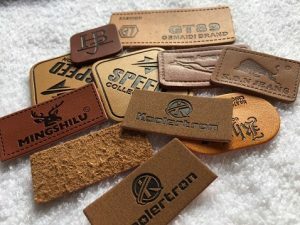 Faux leather labels are less expensive than genuine leather, as they’re made from imitation materials, but may still be out of some customers’ price range. That’s why we also sell a rubber leather label, which looks very similar to genuine and faux leather, although the reverse is slightly different. As our cheapest option, PU leather labels are for customers with the tightest budgets, but they’re the lowest quality when compared to genuine leather, and look and feel the least like the real thing. 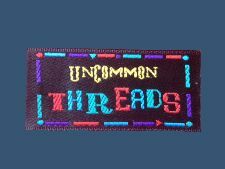 For those of you looking for something low-cost and a little bit different, we can also manufacturer leather-look woven fabric labels. They’re composed of woven fabric instead of genuine or imitation leather, but are designed to take on the appearance of real leather. Take a look at our beautiful range of leather labels to see the difference for yourself. Contact us today for design unique leather and woven fabric label for your clothing business.